Google have repeatedly said that Android 2.x builds are not designed for tablets, with Android 3.0 specifically designed for the larger screen and offering a more complete experience. We’ve been in contact with Creative who have again confirmed that an Android 2.2 update is coming, but they wouldn’t commit to 3.0 – we suspect the resistive screen would be a barrier. Android 2.2, if it does deliver the Android Market as promised, will certainly make life easier and improve the experience out of the box, although there is no guarantee it will bring the other Google applications with it. It’s also difficult to ignore that fact that many higher-specd Android 3.0 devices are just around the corner, so the ZiiO 7 has to sell itself on media credentials and affordability alone. If you stick to the remit of a large screen media player, then the Creative ZiiO 7 is worth considering. If you have a selection of videos and music you want to take on your travels, then this will offer you entertainment for half the price you’d pay for an iPad or some rival Android tablets. However, the resistive display will always be a limiting factor, regardless of what updates (official or unofficial) find their way to the device. The Creative Ziio's screen's colours look washed-out, its built-in app store is horrible and it uses an outmoded resistive touchscreen, but it's still one of the best sub-£200 tablets money can buy. Video playback is decent, it's a good-looking device and with a bit of know-how and an hour or two's tinkering you can seriously boost its functionality. The Creative ZiiO 7" definitely doesn't belong to the verified "iPad Killers". But it's not trying to, either. All the same, you can get two Creative ZiiO 7"s with an 8 GB memory for the price of one iPad. In return, the Creative ZiiO 7" is rather more multimedia center. Considering the tablets possibilities of being connected to a TV via HDMI or wireless with the according audio speaker, it's still looking for its equals. Merely the resistive touchscreen and the old Android version dim the picture a bit. You get what you can expect for 249 euros from the case – namely plastic. However, it's been well-manufactured and is pleasant to hold thanks to its design. We can recommend the Creative ZiiO 7" multimedia tablet to those who find a smartphone too small and a 10" tablet too big. 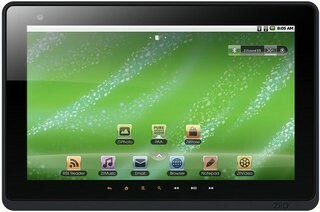 The tablet is simply more portable in view of its 7 inches, and handier than a 10" model in many situations. Also, if you put a lot of value on audio and video, you could be happy with the Creative ZiiO 7". Nevertheless, the lack of compatibility with Apps clouds the total impression to a great extent. It's a long way behind the iPad and the Galaxy Tab in terms of overall usability. 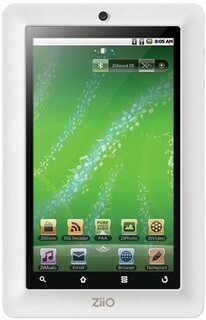 But at just £199, the Creative Ziio does offer great value for money. If you've got £200 to spend, you won't find a better tablet than the Creative Ziio. You know what, I think we should leave it there. On a positive or I’m only going to be dragged back into slaughtering this device. There are so many flaws in the software it’s an easy conclusion to come to. If you want something that will leave something in your wallet, then you might want to consider this as I imagine it’s combination of quality hardware and decent media software will trump it’s competitors. However, a meagre battery life, poor implementation of Android, bugs, bugs and more bugs (hopefully fixed in the imminent update to 2.2) and terrible screen resolution, just completely lets this down and in truth, I would rather save up a bit longer or take out a terrible rate loan with no means to pay it back and buy an Apple iPad or at least a Galaxy Tab, than feel the disappointment one would feel after buying a tablet like this. Or maybe I just expect too much for £199.99. Despite all this, the Creative ZiiO is rarely frustrating, which is high praise when some £400 tablets have left us tearing our hair out. It feels a little toylike at times and it certainly has its foibles – of which providing nowhere to store the stylus when not in use is the most annoying – yet it remains likeable throughout. Many tablets at twice the price are no more usable or consistent, so as long as you’re fully aware that you’re getting an unpolished Wi-Fi-only device, the ZiiO is an affordable way into a crowded market. Visit the Creative Q&A Forum to get answers, ask a question or help others.